Some people love winter because of how beautiful all the snow looks. Sure, the freshly fallen snow looks gorgeous blanketed across hills, but once it mixes with mud, salt and road grime, it looks terrible - and it looks even worse inside our Jeeps. Tracking snow inside your Wrangler is dangerous for your interior, and even more dangerous for you and your passengers - if your feet are sliding around, you can't get a good purchase on the gas or brake pedals. 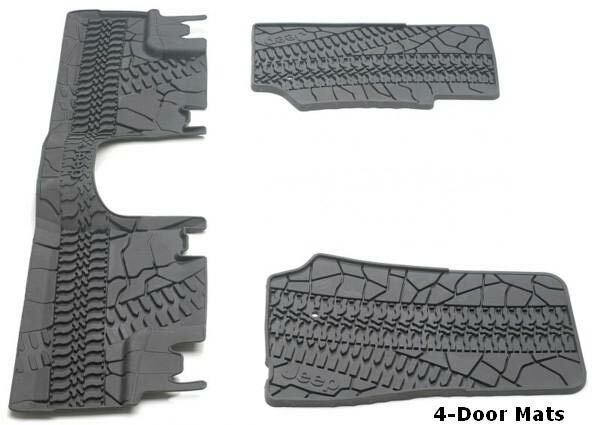 Solve your problem with these Jeep Wrangler all weather floor mats. 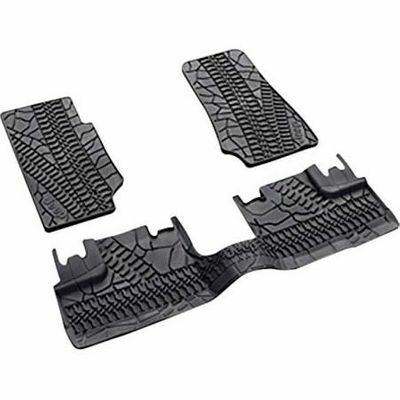 These replacement floor mats feature a clever tire tread pattern that gives space for all that snow and ice to harmlessly melt off your boots, without damaging your upholstery. Because they are made by Mopar, you'll have the confidence of a perfect, snug fit, even with your 2007-2018 Wrangler's oddly-shaped footspaces. You'll also be able to remove them easily for cleaning when spring comes - and that's when you'll find out these slush mats easily handle mud, as well. You'll get year-round use out of these slush mats, and when you order from Just for Jeeps, you'll enjoy deep discounts and great deals on shipping. 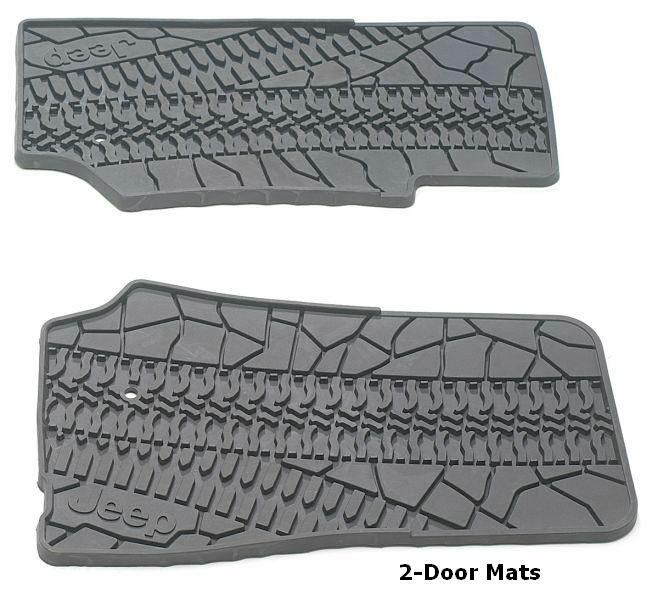 2-Door Front Slush Mats only or 4-Door Front & Rear Slush Mats, Slate Gray, Unique Pattern with Jeep Logo. 2 Door Mats do not come with a mat for the rear seat. Product is perfect Mopar OEM. The fit was perfect. Really brings out the Jeep�€™s aggressiveness. Product was labeled to ship same day of ordering. Five Stars from Tennessee. Perfect fit and seems like better than weather tech. Replacing 4 1/2 year olds just because. These mats fit perfect and look great! I am addicted to your site! I�€™ve always wanted a Wrangler and am loving it! Would have given 5 stars, but found the same mats at a different retailer for a lot less. That being said the floor mats are very good. Great addition to my JK! These mats are very durable and fit seamlessly - exactly what I was looking for! These are original Mopar maps that are custom and very practical. They fit perfectly in my JK Unlimited with maximum floor coverage. One of the best products I ever bought! ProsKeeps dirt off carpet and only on the slush mat. Easy removal for cleanup. Very practical and looks great! ConsNo cons to be said. Great buy! Perfect fit, great material. They look great! Got these mats for my mom who just joined the jeep family! Quality stuff! Mats were very easy to order. Came quickly. Fit perfectly. The floor mats fit perfectly. They arrived on time. They are good quality and durable. Very pleased! Great design and looks great! Five stars! Fit perfectly and look great. What else can I say. Slush floor mats are great! So far, they are working out great! I replaced the cheap ones from a local store that I was using with these. I really like the way they feel under my feet, and I like the way the grit from the dirt roads out here fall into the crevasses of these mats and don't keep rolling around right under my feet. ConsWish they covered the floor on the sides a bit more. These floormats are perfect for a Jeep, easy to clean and fit great. Fits like a glove. Covers a large surface area, especially the rear mats, to catch more rain and slush. Decent lip along the edges. And the tread pattern is just cool. Overall very happy with this purchase. Everything shipped quickly and the lowest price I could find. Thanks.